Not Sure of Where to Stay in Barcelona? bizFlats Can Help! Barcelona is filled with countless, unbelievable attractions and characteristics that make it one of the most desired vacation destinations in the world. If you’re planning a getaway to this remarkable place, you might not be sure of where to stay here. That’s why you should check out bizFlats! We have all the best vacation rentals, spread throughout the most exciting and gorgeous parts of the city. Read our list below to discover the best places to stay in Barcelona and an example of a rental home we have located there. One of Barcelona’s most beloved attractions, the Barri Gòtic, or Gothic Quarter, is a fantastic solution for where to stay in Barcelona. This neighborhood is one of Barcelona’s oldest spots; its pristine courtyard is a popular area for visitors and locals alike to relax and enjoy the beauty of the city. In addition to its many shops and cafes, Barri Gòtic is home to numerous bars and clubs, making it the best area to stay in Barcelona for nightlife. Colonial: This incredible bizFlats’ apartment is tucked away in the heart of the Gothic Quarter! Experience luxury like you never have before when you book your stay in our Colonial rental; this four-person apartment is equipped with a modern kitchen, flat screen television, and wireless internet. This is another favorite Barcelona neighborhood due to its abundance of modern architecture, ancient streets, and amazing restaurants. Here, you’ll be able to see some of Gaudi’s finest masterpieces, including La Sagrada Família, La Pedrera, and Casa Batlló. Red Carpet: We couldn’t have named this apartment any more accurately! Red Carpet is a deluxe rental in L’Eixample that has five bedrooms, three bathrooms, and features amenities such as a jetted bathtub, two balconies, total soundproofing, and a spacious kitchen. The perfect place to stroll and enjoy the city, La Rambla is another iconic Barcelona landmark. It contains some of the most entertaining attractions of the city, such as the Gran Teatre del Liceu, where the magnificent Barcelona opera is performed, and the Boqueria Market, where numerous vendors gather to display their products to the public. Parsifal: This bizFlats apartment provides wonderful views of the city. Take advantage of the fully equipped kitchen, modern furniture, and antique mahogany table in the dining room to fully appreciate your getaway to Barcelona. The village Sitges is an idea location for many people; not only does it provide a more secluded and private residence area, but it’s also a short distance from both the city and the beaches! Villa Downstairs: You will love unwinding in this Barcelona paradise! Nestled in one of the colossal mountains, Villa Downstairs includes a garden and swimming pool along with its other many great qualities. You’ll be blown away by the unparalleled beauty of this unique rental in Barcelona. Now that you have received a sample of our numerous and marvelous apartment rentals, don’t wait another second! Check our availability at bizFlats and book your favorite vacation home today! 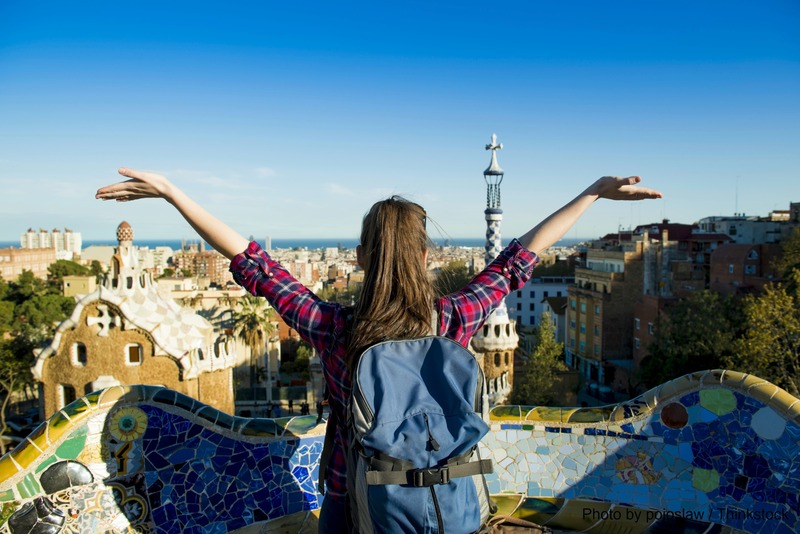 Visiting Barcelona is an experience like no other; its countless attractions, such as the Barcelona Gothic Quarter, La Sagrada Familia, and El Raval, pique the interest of almost everyone who travels to this exotic and fascinating destination. If you’re interested in taking a trip to this amazing paradise, you’ll want to see as much of the city as possible! To ensure that you’re able to view all the key elements of this city, try one of many educational walking tours offered here. All of these tours are led by English-speaking, professional guides who are passionate about Barcelona and its history. Each provides an assortment of different tours that encompass a wide variety of topics. Check out our list of our four favorite walking tours- all completely free of charge- to help you enjoy your Barcelona vacation to the fullest! Opportunities for learning are endless when you participate in one of the many Runner Bean Tours! Delve into the life of Gaudi, discover the secrets of Europe’s medieval districts, learn all the dark details of the Spanish Inquisition, and acknowledge the impact of the Spanish Civil War. They even offer tours designed for kids, as well as private tours for you and some friends. Every day at 1:00, 3:00, and 5:00 p.m., Travel Bound’s expert guides lead visitors on a 2.5-hour tour of the city. 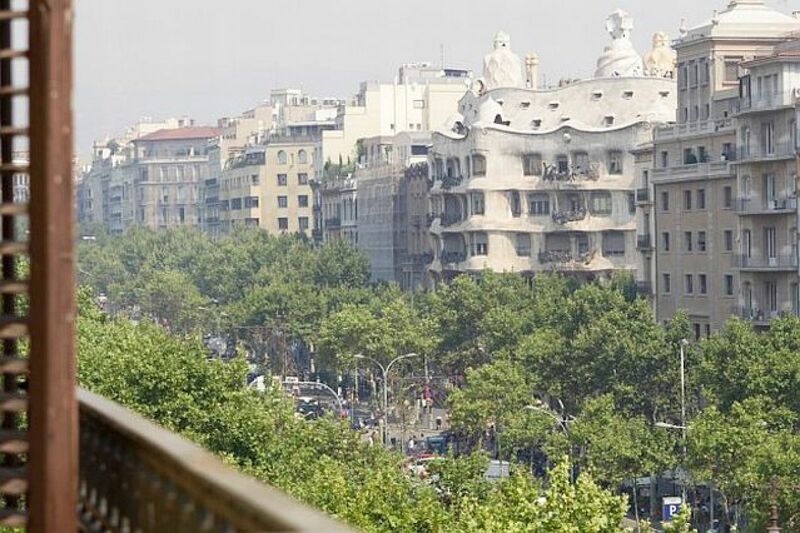 This tour features many of Barcelona’s iconic attractions; it also gives attention to Barcelona’s abundance of modern art and the works of Picasso and Miro. After the end of the tour, guests are invited to grab a drink at the Travel Bar and ask the tour guides any additional questions they might have. This 3-hour tour explores some of the most well-known attractions of Barcelona. 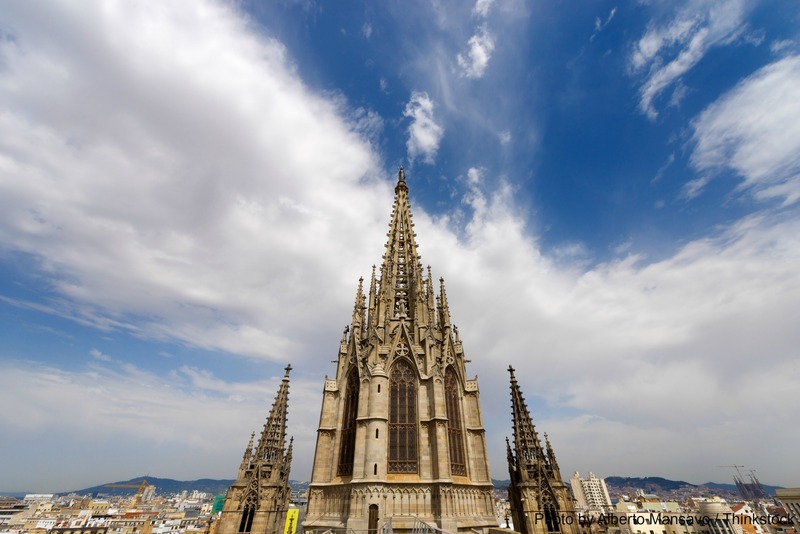 Highlights of Sandeman’s New Barcelona Tour include the Barcelona Cathedral, the Roman Necropolis, Port Vell Historic Harbor, and the Gothic Quarter Barcelona. This tour focuses on the history of Barcelona; specifically, the intrepid individuals that helped make this place great. This amazing Barcelona sightseeing experience allows you to choose from four different routes: the Gothic Route, the Gaudi Route, the Barceloneta Beach Bike Tour, and the Alternative Tour. Each of these Free Walking Tour outings lasts about 2-2.25 hours and includes visits to both famous landmarks and areas you may never have heard of before. Show up to the designated meeting spot specified online and look for the tour guides in their purple T-shirts under a purple umbrella! Now that you know everything there is to do and see in Barcelona, finish planning your dream vacation by booking one of our fantastic rentals! bizFlats has numerous properties, including lofts, penthouses, villas, and apartments, all located throughout the most picturesque parts of the city. Each of them features the most luxurious rooms and amenities, such as a pool, hot tub, roof terrace, and more! Don’t miss out- check our availability and book your favorite spot today! Barcelona is bursting with unbelievably dazzling sights to behold; pristine beaches, towering cathedrals, colorful city streets, and colossal mountains. With this abundance of breathtaking beauty, as well as numerous attractions and fascinating culture, Barcelona is the ultimate vacation destination for anyone craving a marvelous and exotic adventure. While you’re exploring the many things to do in this city, be sure to stay in the best possible lodging! bizFlats Vacation Rentals wants to help you have the most memorable getaway ever, so book a stay in one of our many rental properties! Each of our apartments, penthouses, lofts, and villas are all designed for your ultimate comfort and relaxation with their wonderful amenities and features. We even have luxury apartments in Barcelona with a terrace so you don’t have to limit yourself to sightseeing only during your afternoon excursions; you can admire views of the city from the balcony of your home-away-from home! Check out 5 of our best apartments with a terrace in Barcelona and start planning your dream vacation today! A spacious and elegant apartment, Garden House contains three bedrooms, two bathrooms, a fully equipped kitchen, and an exclusive terrace. Within walking distance of the famous Sagrada Familia, one of the most beloved attractions around, Garden House is a prime spot to stay in Barcelona! Surrounded by gorgeous Barcelona homes, Mira is an excellent two-bedroom, one-bathroom corner of a magnificent neighborhood. With a terrace overlooking a water lily pond, a deluxe kitchen, and a fully equipped office, this executive apartment is great for both work and pleasure. For a more bustling and energetic environment, stay in Boutique! This three-bedroom, two-bathroom apartment is located on a pedestrian street of the Poblenou neighborhood, which is filled with amazing shops and cafes that you can view from the terrace. This spot is within walking distance of the beach, so if you love the sun and sand, this is the right vacation home for you. This complex will thoroughly impress you! Duplex C of Fira Place can sleep up to six guests; its comfortable furnishing and lively decor provides a lovely backdrop as well. 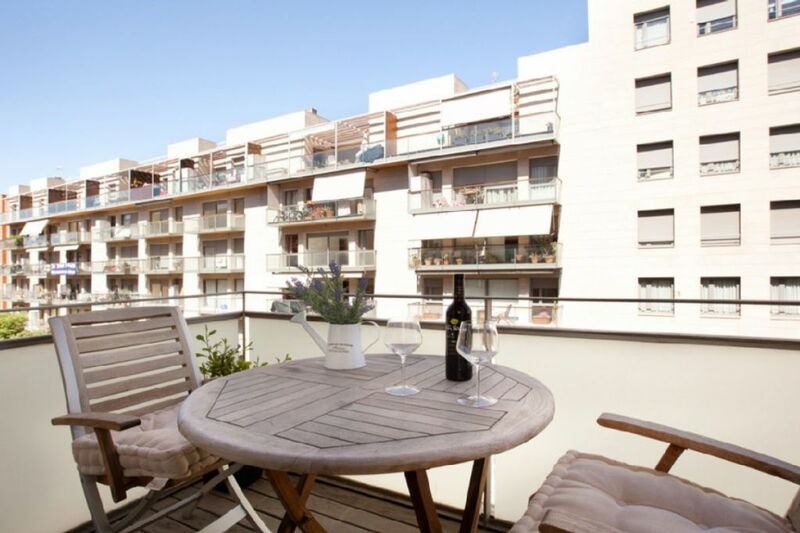 Haven’t you always wanted to stay in one of the apartments in Barcelona with a roof terrace? Fira Place has a spacious, communal terrace on the roof where guests can gaze at the city and the stars! A one-bedroom, one-bathroom apartment, Neo is a small but cozy haven, tucked away within some quiet, pedestrian streets of Barcelona. The terrace overlooks the peaceful atmosphere of the surrounding streets, creating the ideal spot for a morning cup of coffee! Now that you’ve gotten a taste of what we have to offer, visit bizFlats’ website to check our availability today! We offer a wide range of properties, each equipped with the finest furnishings and amenities. Start planning your vacation of a lifetime today!